doesn’t have to follow a lonely path however ~ especially when you’re in good company with folk who’ve already taken their words into print in their own unique way . . .
may not have a magic wand or fairy godmother inclinations, but we do understand the frustrations and problems that new and established authors alike face in trying to get published, or finding reliable support for editorial, review or beta-reading and typesetting services in this day and age when it’s never been ‘easier’ to get books published on various traditional and digital platforms. Which is why we decided to start over and form our own collective. 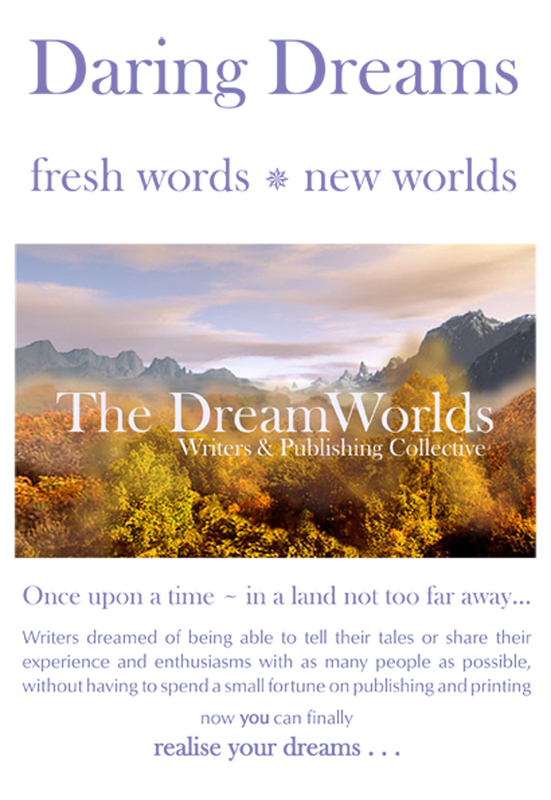 At the root of the DreamWorlds ethos is a well of friendship and passion for spinning tales and writing where our respective inclinations take us. Bringing our own publishing ambitions to fruition was another matter however, even for those of us who already had work in print, but sadly gathering dust on shelves that rarely saw an eager hand, or a smile of anticipation at delights to come. The idea of self-publishing started to emerge as the only realistic and viable solution for well-written, enthralling works of fiction and fantasy that resonated strongly beyond pre-existing genres and defied categorisation, that traditional routes to publication had either failed to do justice to, or to turn away altogether because the work posed too much of a ‘challenge’ to perceived run of the mill markets. We beg to differ and firmly believe that readers are always ready for fresh, original fiction that gathers them up and turn words into new worlds of ideas, emotions and sensations. was formed at the end of 2013 to realise the launch of Milele Safari ~ An Eternal Journey penned by Jan Hawke, one of the founding members of DreamWorlds the fan forum, from which our writers’ collective has grown. Fellow DreamWorlds inhabitant Sue Bridgwater provided sterling copy editing support to Jan, who was then able to use her own skills in digital typesetting, cover design and print production to polish the novel up and publish it worldwide courtesy of professional Print on Demand (POD) specialists Lightning Source International. The book is now attracting favourable online reviews on Amazon, Barnes & Noble and Waterstones and paid for the costs of its publication in less than a month. We don’t pretend that this has been an easy road, but it has been a satisfying and often exhilarating one, seeing a raw story begin to shine and take form as a fully fledged paperback and then an eBook and appear beside our own literary heroes works on the shelves of ‘proper’ bookstores to be discovered and read by readers just like ourselves, who love and treasure good books. evolved out of our pre-existing forum environment which already contained a ‘Word Smithy’ for writers to find beta readers and receive feedback or reviews for fan fiction or more original works. So it was only a small hop, skip and jump to transfer the writers forums over to the publishing side of DreamWorlds and set to work with fellow writers and friends, old and new to provide a functional support network of editorial and publication services where skills and funding is shared and help each other make our dreams of being published authors come to shimmering life. Possibly the most vexed aspect of the self-publishing route for most writers of a certain age is how to ‘promote’ themselves using digital and online media. Although printed books are as much in demand as they always were the advent of eBooks, online communities and social networking means that getting attention for your work is easy to do but increasingly difficult to get right. Our community encompasses people who don’t necessarily take to marketing techniques too readily, but we are lucky enough to have several doughty souls who are prepared to dip into the mysteries of Facebook, Twitter and increasingly the world of blogging (courtesy of great techno sites like WordPress, Blogger and Tumblr etc) and other isoteric social enclave areas of the internet that book lovers can and do frequent. Connecting is the new grapevine and so we have recently introduced a blogging section to the DreamWorlds site where our writers can keep personal online journals to use as their window on the wider bibliophile community as promotional or sales tools, or just for notes or to use as a scrapbook for their work. Because we have writers, we also have readers in our community and so we also made a conscious decision to make venues where both factions could mingle and talk and showcase reviews and generally talk about favourite books and authors and what make it all tick. The Collective’s forum shares the same web space as our original DreamWorlds forums and shares many of its aims in that writers can put up work for beta reading or feedback long before the story’s ready for publication so we have threads that are like the factory floor for new works where you might be asked to comment on a map for a new world, or an array of photographic ‘mood’ shots for a character or scene setting, or even take part in a poll discussion on what direction the plot should follow next! Essentially, our publishing forums are a place where you can network with writers and readers, editors and typographers, illustrators and layout designers in as much depth as you can handle, whether it’s on the topic thread, via private messaging or taking it to another level and going off into the online equivalents of a huddle via email, Skype, Google Hangouts or whatever floats your cyber socialising boat. DreamWorlds in the end is all about a space for you to stretch out in every direction, including a cerebral one and to come and go as suits you best. The collective side of it can be whatever you want to take from it – as cosy as a family kitchen or a flexible, organic support network where you choose your own direction. With people who know where you’re coming from and want to help you get to your own personal goals.